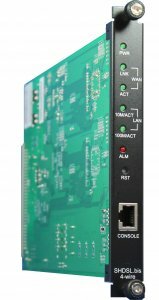 With the SHRM-08 card high transfer speeds of up to 5.7 / 11.4 Mbit/s can be achieved for direct Ethernet network coupling over an existing, unshielded, twisted 2 or 4-wire copper line. The devices adapt their transfer speed automatically or manually to the quality of the line, guaranteeing fault-free operation. The transfer distance and speed are dependent on the line cross-section, the number of parallel G.SHDSL sections and the possible disturbance variables (bandwidth adaptation). Speeds of 320 kbit/s can still be achieved over 20 km. For greater ranges, repeater solutions are available. The SHRM-08 can also be operated with a bus circuit, meaning just one device is required per station for 2-wire applications. SHRM cards do not just optimise the transfer speed to your outstations: they also have integrated high-end bridging/routing with additional functions such as a ring circuit, firewall and NAT/DMZ. Remote access via browser and SNMP are available for management of the devices. SHRM cards are compatible with other ATM/EFM-based G.SHDSL routers / bridge systems.